From the land of Pterotactyls, I put down the needles for a second to write this post amidst many changes here at Marc Smollin Designs. As some of you may already know, I have acquired a workspace in Berlin at Urbanstr. 88. If you are in Berlin, you can stop by to visit me anytime I’m in the studio! 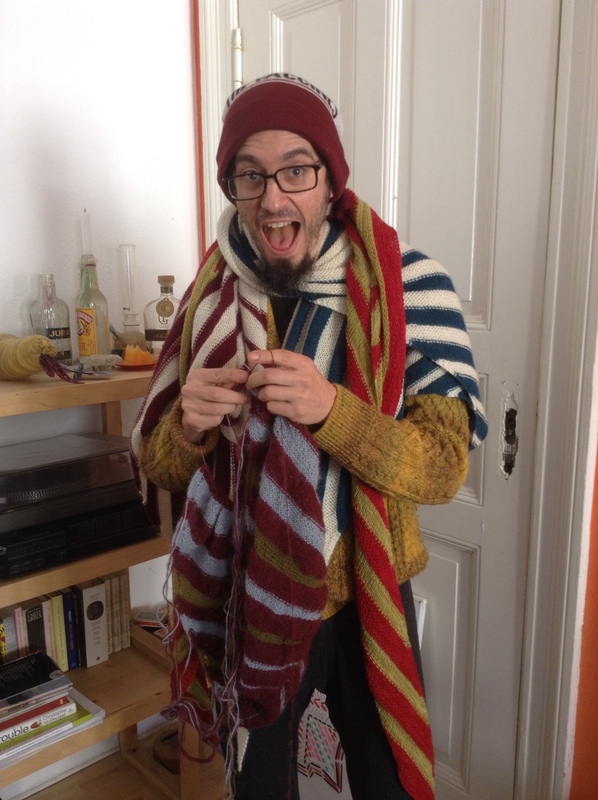 With production in the works, I am very busy knitting these days. But I am still weaving textiles in the studio, and a plan is slowly forming to create a complete line of knit- and woven-wear for 2016/ 2017. Soon, MSD will break out of the world of accessories and find it’s home in the world of fashion. Until then, you can always watch me working in the studio (when I’m there) in the live feed. When I woke up yesterday morning, I realized that it was only 24 hours until my one-week trip with Andy to Rome and Naples! 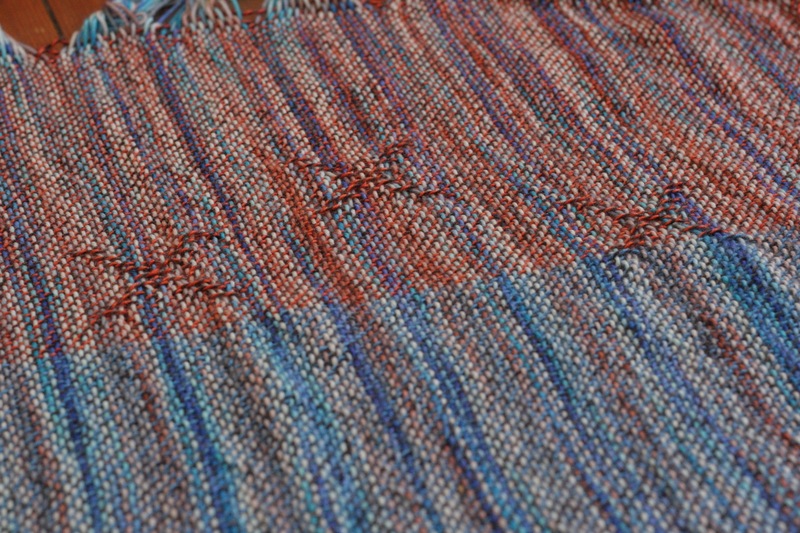 However, the day before I had warped a two-meter piece on the Kromski, and I knew I just couldn’t possibly enjoy a vacation knowing there was unfinished work on the loom. Still, I had to run a lot of errands — so it wasn’t until 6pm that I finally had a chance to sit down, thread, and start weaving. We watched “Muriel’s Wedding” and episodes of “Drawn Together” while I wove non-stop. By 2:30am this morning, the piece was finished, blocked, and drying. 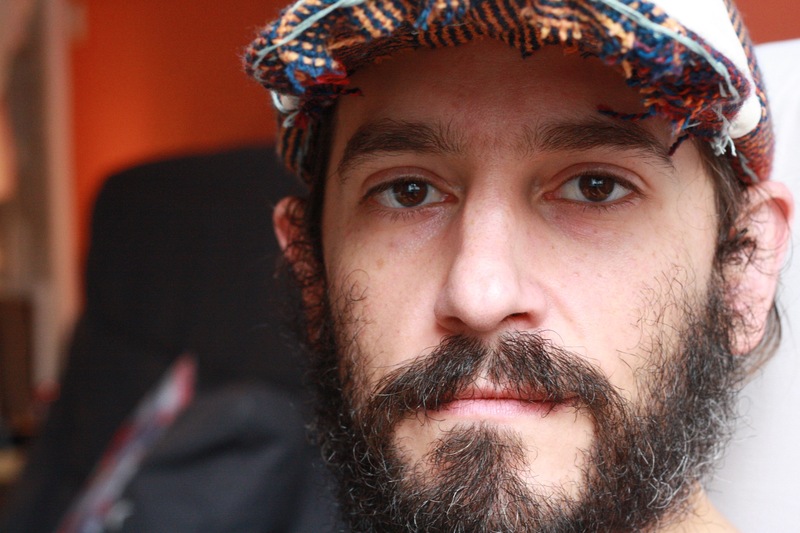 For the warp, I used Dibadu Funnies. It’s a great yarn for the warp, actually, because it’s really slippery, so you don’t have to deal with unsticking your warp threads ever. This meant that I could work faster than I have been able to on other pieces. 1. 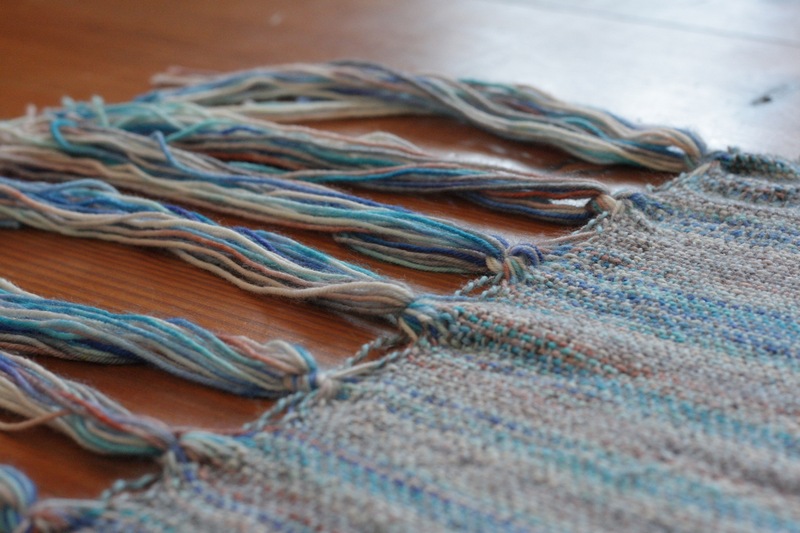 A high-twist, handspun (and therefore somewhat inconsistent-in-thickness) yarn will not lay comfortably in the weave. This, in and of itself, is a kind of limiting texture, in that additional layers of texture tend to get lost in the overall picture. 2. While diamonds and diagonals look great as a warp-based float, crosses do not. 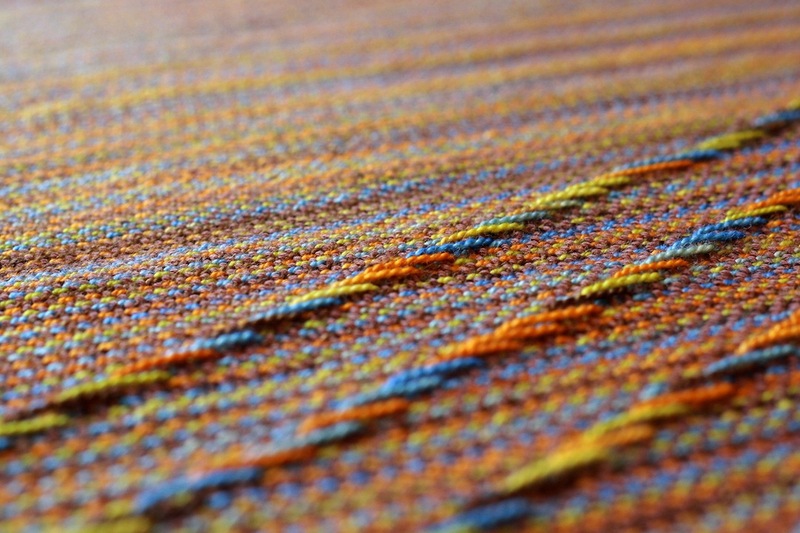 They look much more pleasing to the eye as weft-based. 3. When I finally accepted that Xes were just not going to happen, everything became much easier and looked better. I managed to capture some nice pictures of the piece, and I particularly love the second half of it (when I finally gave up on the double-texture). However, this was much more of a learning-how-to-deal-with-yarn-and-not-rushing moment than a showing-off-my-design-skills one. Today is my birthday. It’s been a thunderstormy day here in Berlin, and I didn’t feel like warping this morning. 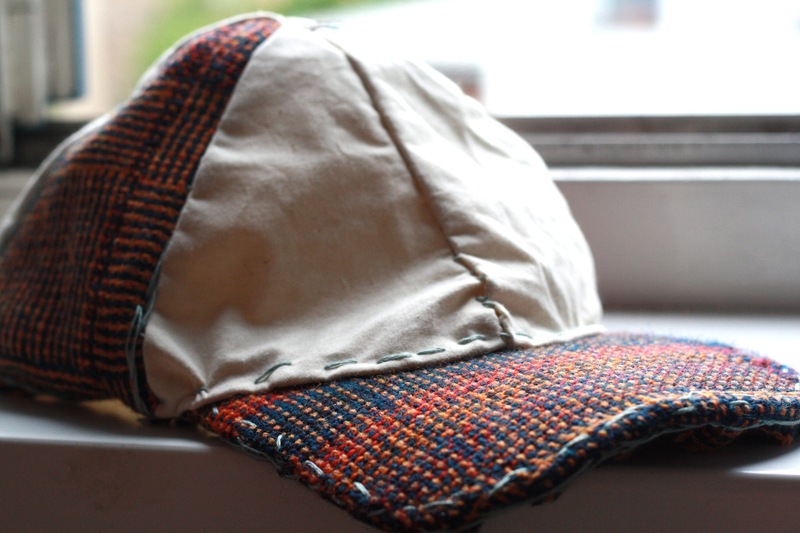 Instead, I played with some of my fabric and turned it into a cap. It’s pretty much the sloppiest thing I’ve ever made, but I wanted to know the form and shape of a baseball hat, and now I know it! I used a 60cm x 60cm piece of handwoven fabric, and another 50cm x 50cm piece of cotton muslin. 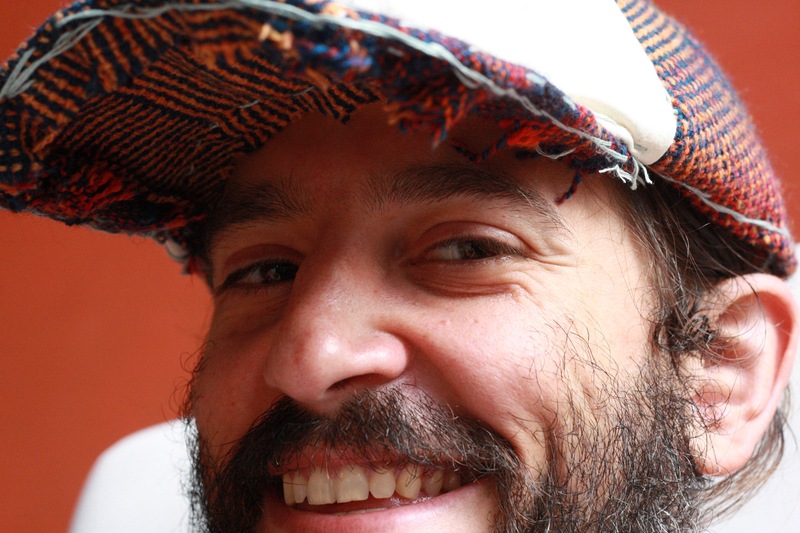 The bowl of the hat is made of six double-thick triangles sewn together. 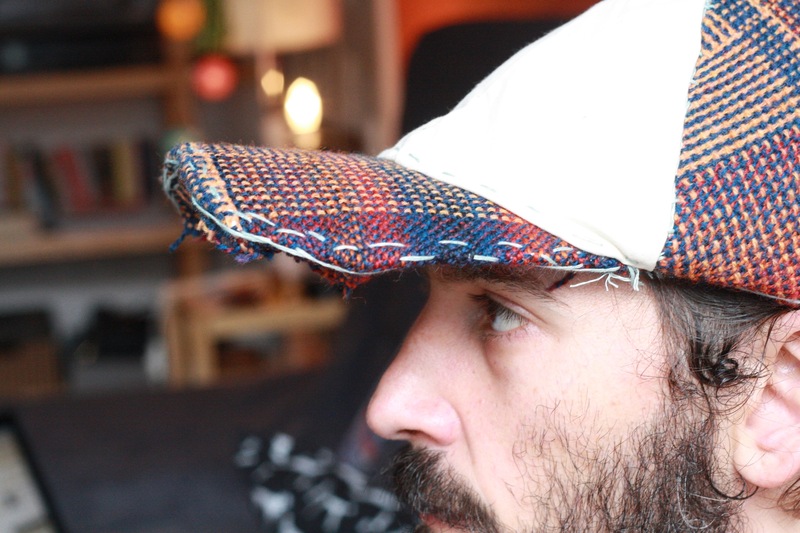 The brim is made with a cut piece of Cinnamon Toast Crunch cereal box wrapped in more of my handwoven fabric. Anyway, it is functional and charming, and it is my birthday gift to myself on this rainy birthday, so I thought I’d share it with you. 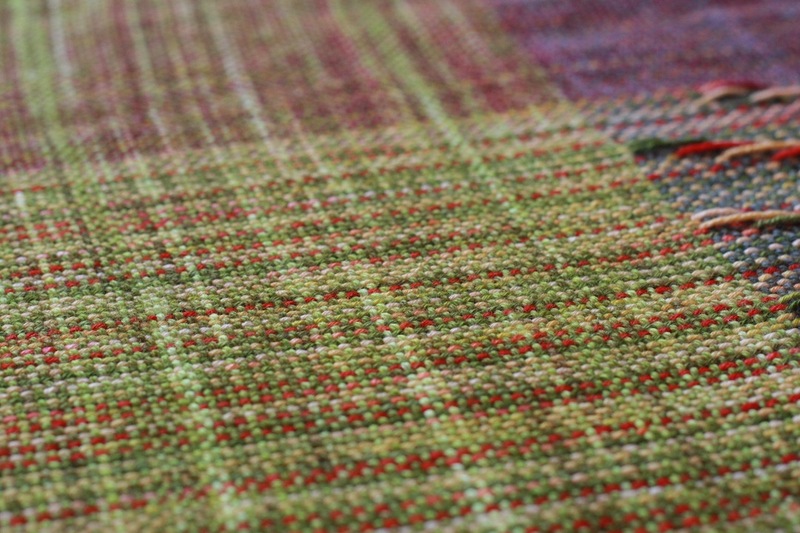 My moment of weaving obsessively continues, and I completed two more pieces since my last blog! Each piece gets bigger (I’m up to about 300 threads in a 70cm-wide piece), and I’ve started honing in on a specific warp-based texture. First came Diagonals. I imagined a piece that was a series of diagonal warp-facing floats of different lengths. 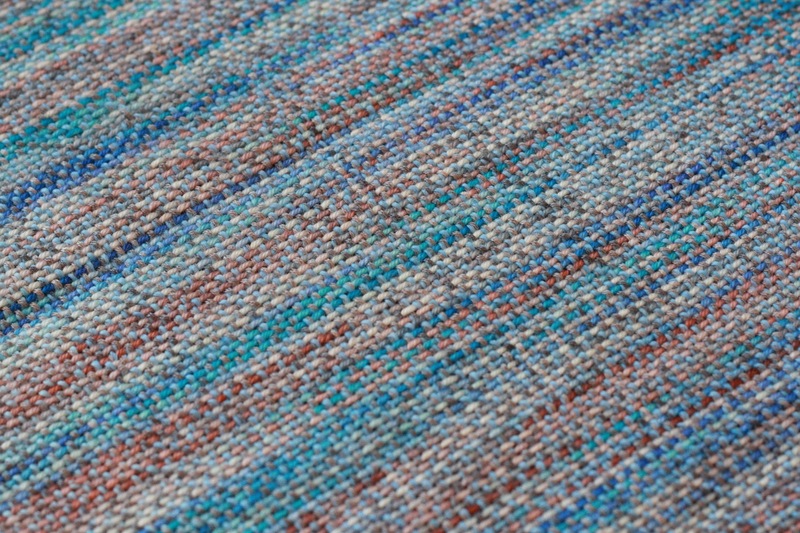 The texture worked out great — it’s kind of like a twill, except “zoomed in.” The warp is a multi-color Tosh sock yarn that I picked up in Oregon at an awesome yarn shop called Twisted. 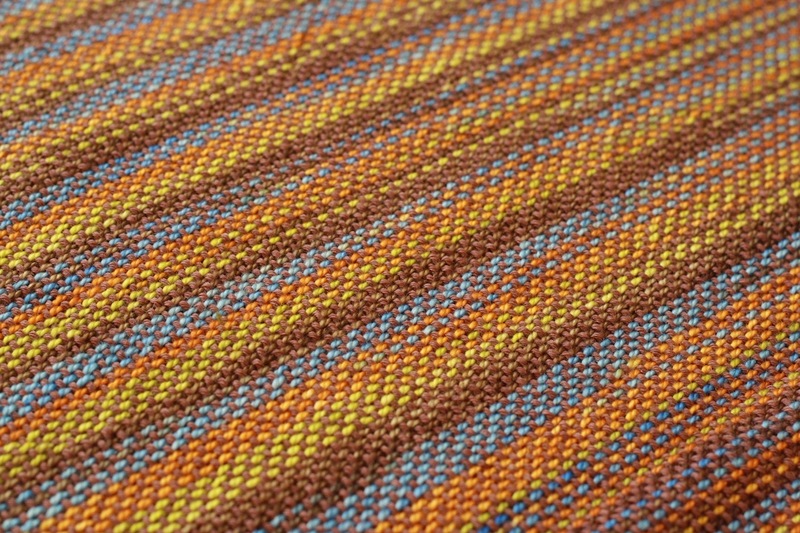 The weft is a solid brown Wollmeise, with a touch of Kito yellow alpaca thrown in at the end. Next was Arrowheads. The result of knitting top-down with short rows in stripes (a la Pterotactyl) is a series of Arrowheads. I wanted to try and re-create this idea in a woven fabric. So I employed the same two-thread warp float, only moving them away from each other every 4 rows. The result is spectacular! Again, the warp is made of two different multi-color Wollmeises, and the weft is a Blue Moon merino in dark green that is an good contrast. 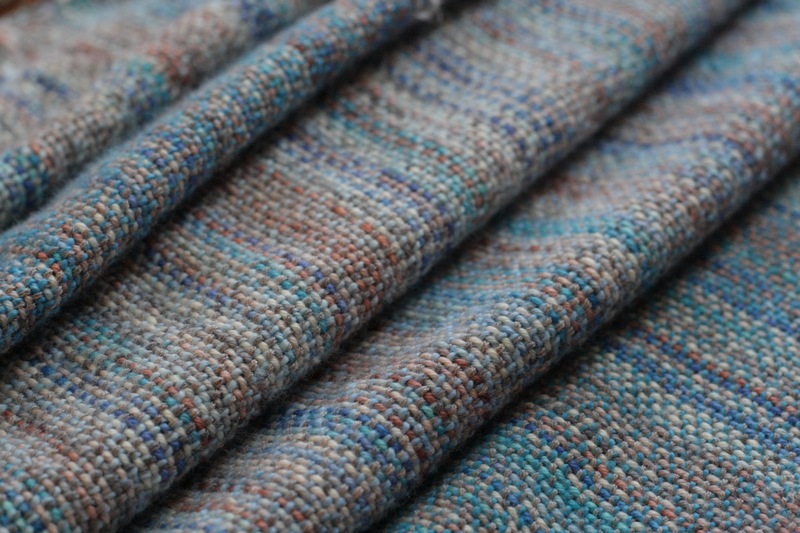 In conclusion, weaving seems far superior than knitting right now. 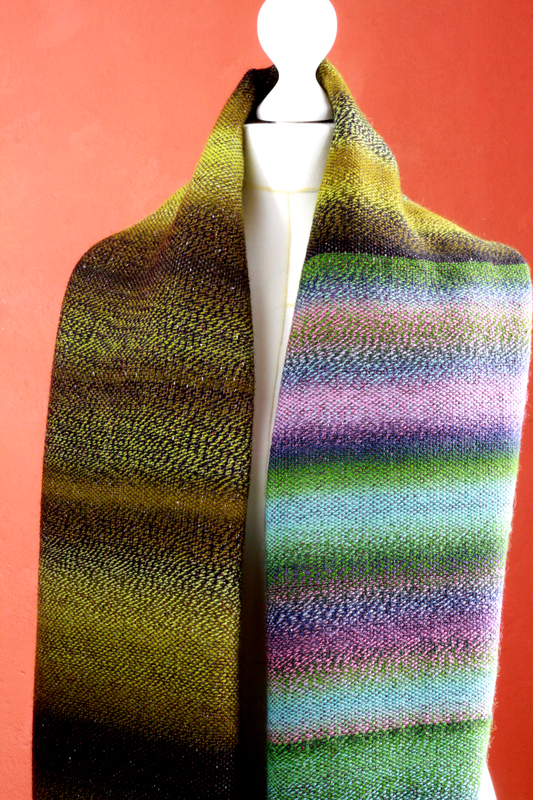 A good-size knit shawl is usually around 1,200 yards of yarn, and it takes between 5 to 10 days to knit. 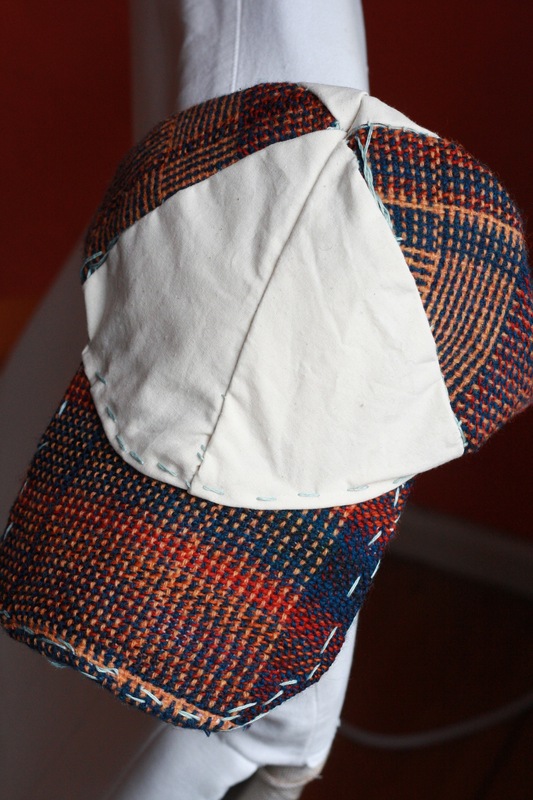 To weave the same size and quantity piece will only take between 1 to 2 days. 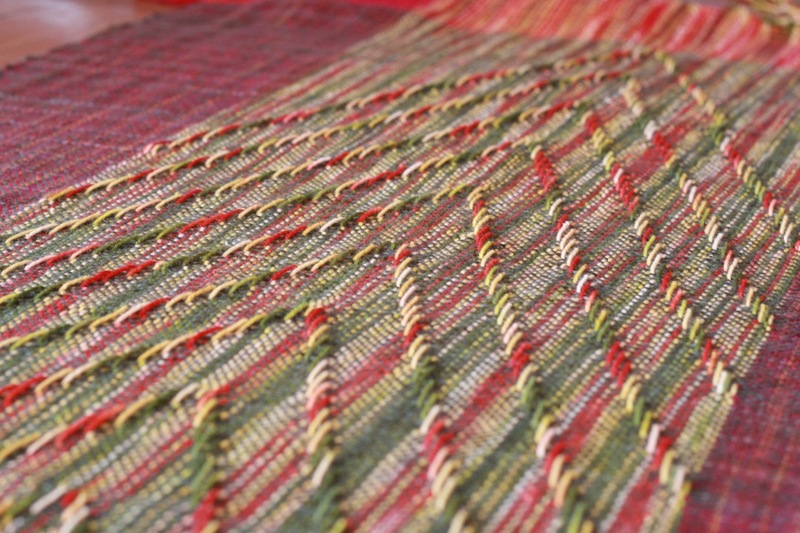 And this is just rigid-heddle weaving! Imagine the possibilities with a 4-, 8-, or even 16-shaft loom! 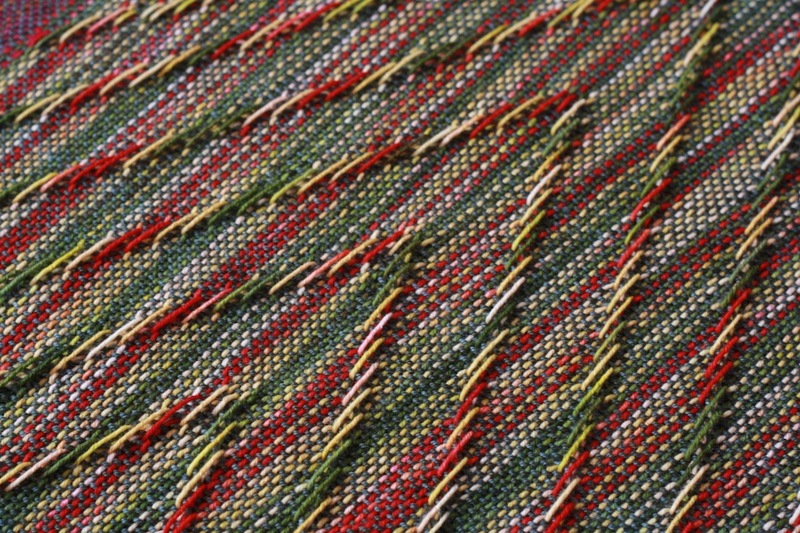 So for now it’s multi-color warps, single-color contrast wefts, and discovering the range of texture possibilities within the rigid-heddle context. Check back for the results! It’s been a while since my last post, and I haven’t done much knitting at all! Instead, I’ve been spending almost every waking hour at the Kromski loom, weaving rigid-heddle style. When it’s time for bed, I can’t fall asleep because I’m planning my next warp or thinking about pick-up-stick designs. Thanks to my best friend, Sabine, I got to go to the Berlin Textile Art fair this past weekend. There was some incredible weaving there and a lot of inspiration. When I came back home, I started warping the biggest pieces to date (60 cm in width, 200 cm in length). So my bestie, Sabine, brought me an 80cm Kromski harp. In between a lot of knitting and crocheting, I found some time to make the biggest piece of woven fabric I have made to-date. 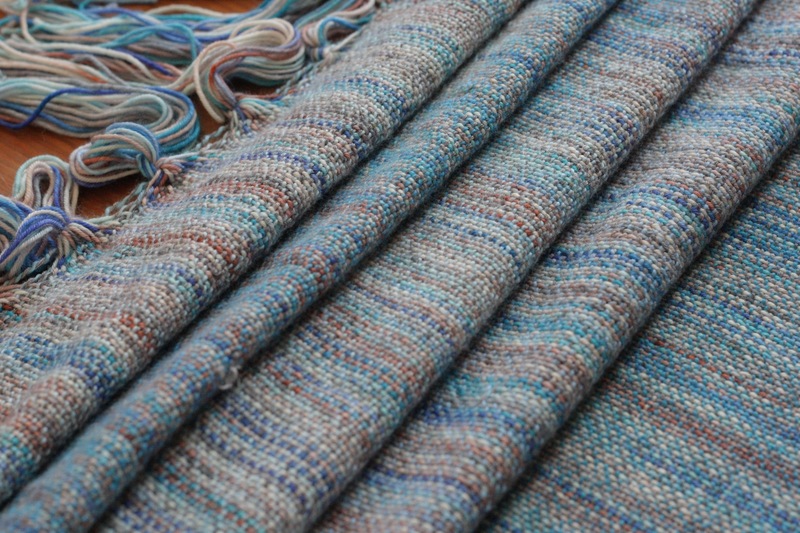 Using the 10-dent heddle, I warped with Habu silk — half in purple, and half in beige. My weft was two balls of Zauberball crazy. I have made several small pieces using the same combination, and the pooling of the Zauberball is always incredible. This piece will now be sent to Italy to be used for a not-yet-announced-and-super-secret project. Stay tuned for more details about the future of this piece by joining me on Facebook or Ravelry. MSD teamed up with Dawanda and Wollen Berlin to bring you this awesome “how to knit” video. Even though it’s technically a beginner’s video, there’s some great information in here for even the most technically advanced. Have a look, and maybe even make yourself a pair of fingerless gloves! Babylicious is a soft, colorful and textured baby blanket using chunky yarn and double crochet. A quick and easy project that is sure to keep your baby warm this winter! Pattern now available! 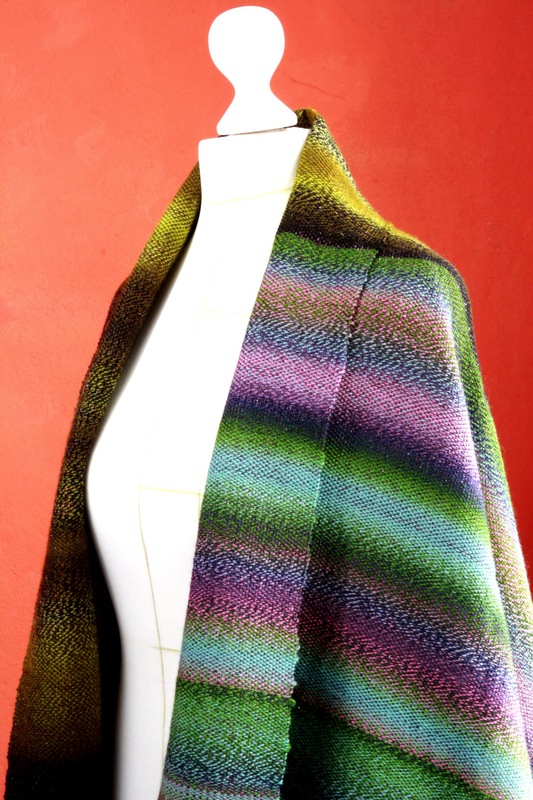 Presenting Strade, the newest shawl pattern by Marc Smollin Designs. Click the photo for more info! MSD has teamed up with local yarn shop Wollen Berlin and online craft website DaWanda for crochet tutorials. Check out our first video on beginning crochet. Stay tuned for more!